A cross country road-trip holds a special kind of mystique for many travelers. Friends tell me they’re envious and wish they could go. It resurrects Jack Kerouac…visions of a cross-country motorcycle trip…stories of hitchhiking.…pinings for something done in our past….or dredges up urges to quit your job and let the chips fall. I’m on a bee line to California, from Maine, helping a friend who’s moving there with the driving. We’ll stop for a couple of short breaks along the way, but otherwise, I’m an outdoor adventurer shackled to a car seat watching the miles of early winter landscapes roll by, teasing me with hints of interesting side trips that won’t make it to my journal pages. The diversity of our landscapes is amazing, and the snapshots of life seen throughout the hours are mesmerizing. The colorful leaves of October in New England have dulled and are strewn in wind-sculpted piles along the roads and woods…few are snow covered in this so-far mild December of 2011. The deer are out in western New York and Pennsylvania, munching on the surprisingly still green grass of highway buffer strips and suburban back yards. The deer and the hunters parked off the highway are like players separated along the trail of a “game board” as the highway peels along …the hunters invariably wherever the deer aren’t. The prairies have an early winter dusting of snow….the Platte River of Nebraska is an equal mix of ice and open water, and the migrating geese seem just as happy on the ice as in the water. Low temperatures have an icy grip on Denver, making the decision of which road to take west an important one. 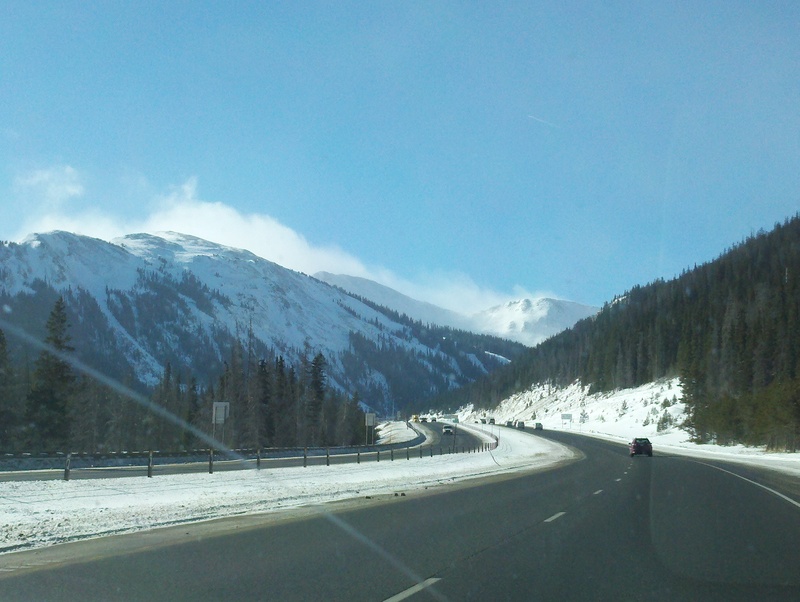 The peaks of the Rockies are snow covered and spectacular on a sunny day after a fresh snow. The promise of spring color in the deserts of Utah about as far gone as the hope for a balanced Federal budget. The only real adventures on this trip are dodging icy roads and timing the trip legs to avoid bad weather. We pass the time counting roadside hawks, and keeping alert for American folk- absurdities and oddball truck stops along the way. One favorite: a huge festive Christmas light display along the highway somewhere in Nebraska…. “MERRY CHRISTMAS – EAT BEEF”…. Exactly. But an adventurers’ mind can’t help to wander to adventure, so I pass large chunks of time imagining what the outdoor minded folks of whichever-parts-I-was-in would be doing on their weekends during this first week in December. Back at trips start, my friends back home in Maine are fitting in some late season bike rides and beach walks in this mild December, some early winter snow hikes in the White Mountains, and some season-extending surfing on the coast. The weather down the road in New York State has been mild too, with records for latest snowfall on the brink of falling. If I had time to spare, I might be sneaking in some late season sea kayaking on Lake Erie or Lake Ontario, planning some hikes in the Adirondacks or Allegheny mountains, or biking the beautiful Finger Lakes region. The Midwestern prairies open up quickly, and begin to chase the forest in western Ohio; this is where the biggest challenge for day dreaming outdoor activities kicks in for me. The huge fields of corn stubble start here…and won’t be ending until somewhere in eastern Colorado. We scan the maps for parks and lakes and see few, but a stop in Iowa City helps focus things a bit. There’s no late season green grass here. There may be some late season bike riding to squeeze in between the cold fronts bullying their way down from Canada with frequency now, but there’s no snow cover for cross-country skiing. Pouring over the atlas makes it clear I wouldn’t be hiking any real elevation within a state or two, but there’s a lifetime of exploring to be done in these middle-of-the-country states. Further west, in Colorado and Utah, its cold and snowy near the Rockies, and the downhill skiers are already into their winter routines. But weather here is notoriously variable, so next week the road bikes and hiking shoes will likely be out again. A long drive in the fall tends to amplify some of the starkness of land development and my “environmentalist” glasses don’t need to be focused too finely to see how all of our outdoor adventures take place under the specter of a land that’s growing shaky-knee’d under the weight of it all. The mostly brown and gray landscape does little to distract from smoke stacks in industrial areas, many of which have blotted views for a century now. Joining these long-established sentries in our skies, is the jolting presence of the mega-wind turbines that stand out in the landscape like armies of giant space invaders; I nod to their promise, but maintain some skepticism in the face of large “up-front” and ongoing environmental costs. In a Great Lakes area paper, I read about the summer and fall algal blooms that now fill the ENTIRE western basin of Lake Erie, probably as a result of ever-increasing use of fertilizers in the surrounding farm-dominated watersheds. I can’t help but wonder what kind of diversity – both biological and cultural – I would see if the stranglehold of corn monoculture could be broken across the middle of our country. Folks in Utah these days are most concerned about their ever-worsening air quality and the health effects of pollution. This being my first trip through Utah and Nevada, I’m jarred by all the unhealed wounds from old and current mining operations. The development and traffic of California makes the head of this Mainer spin, but Californians themselves are wondering how long water will continue to pour out of their faucets (along with a bunch of the other states in the western half of the country), and keeping tabs on the air pollution indexes. Thinking about California air again sends me back to the trips start – the coast of Maine has some of the worst ozone levels in the country during the summer, when prevailing winds travel up the coast from the major cities of the northeast; Maine, a largely rural state, is sometime referred to as the nations’ exhaust pipe. No matter how you look at it, our country begins and ends with us choked by bad air. The list of environmental issues is endless, of course. Trying not to be overly discouraged, I’m thankful this trip has given me new firsthand insight into how significant the challenge is, and it renews my commitment to work to make a difference. Even in early December, most of the country brown and lacking a comforting early winter blanket of snow, there are amazing vistas, incredible diversity, and a ton of reasons to tear yourself away from the late season football games and get outside to find some adventure. It’s easy to find pride, and to find new resolve to draw upon in the battle to save our natural resources and greenspaces. My travels this winter will take me to many places in Central and South America. But a road trip across America to kick it off helps anchor a message about what ropes bind this country together, the contrasting senses of familiarity and strangeness that arise as you cross this country, and how much exploring and adventure are available in our own big back yard. I also realize how much work is ahead if the quality of our outdoor experience is going to stay reasonably positive. Here’s to future side trips off the main road….and a continued opportunity and dedication to keeping environmental causes as part of the discussion. The Golden Gate near trips’ end.